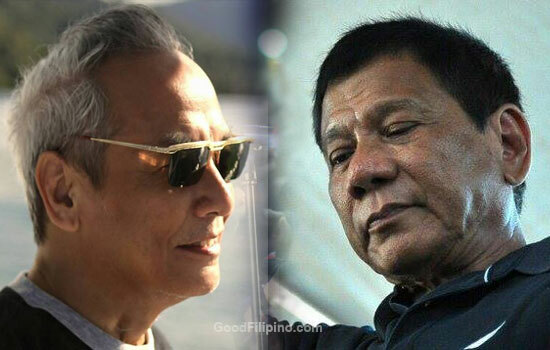 The veteran OPM singer and composer Jim Paredes was put on a hot seat after posting a meme for the late mother of incoming president Rodrigo Duterte. Jim tweeted a painting photo which is called "Whistler's Mother". Some Netizen responded to his tweets who didn't get the meaning of the photo. They asked him, "what's the connect of this to the worst problem of the country?,"
Jim replied, "@yra_sweet naintindihan mo ba? Mukhang hindi. Study some art." The veteran singer wanted to give a double meaning on his tweets against Duterte and his late mother. Jim wants to point out the relationship between Duterte's whistling and the said painting. If you remember the controversial issue about the GMA-7 reporter Mariz Umali during a press conference. The president-elect Rodrigo Duterte draws flak for catcalling her. Paredes done it again! after his recently meme for Duterte where he edited the photo of alleged Sto. Niño's crown and putting the face of Duterte on it then said, "I now reject the Son of God from Davao." In addition to this issue, a Netizen named, '@ellatwitte,' joined Jim's jokes and tweeted another three version of "Whistler's Mother"
She said,"@Jimparedes @emmanjean it confuses me which one is authentic and the real " Whistler's"mom"
Then on the third photo who tweeted by @ellatwitte, the exact 'meme' where they wanted to tease President-elect Duterte and said, "@Jimparedes @emmanjean OMG nahanap ko na yung tunay na Whistler's mother lol. hahaha #hindimakamoveon #forgiveme"
What can you say about this meme for Duterte's mother? Please share your thoughts below. Comments or suggestions about "Paredes, netizen on Duterte's mother meme: 'Duterte’s mom?'" is important to us, you may share it by using the comment box below.